Measuring 20m x 10m with a maple floor suitable for dancing, the hall can seat around 150 people. Chairs and tables are available. There is access to the kitchen and bar. A removable side wall opens to the annex adding 75 extra seating, or could be used as a dining area. 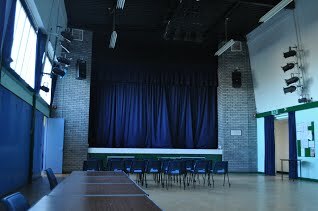 The stage overlooks the main hall. Stage lighting and sound systems are available.